Today's CEOs are facing a major communications problem: they're getting shellacked by the media. And this is costing companies more than lost reputations--it is costing them lost revenue. 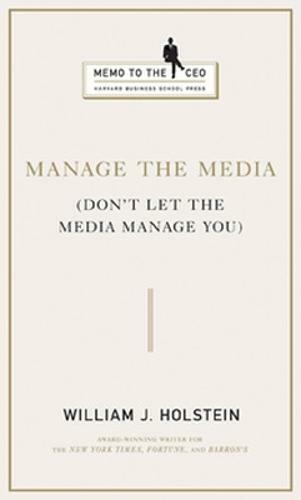 In Manage the Media (Don't Let the Media Manage You), veteran business reporter William J. Holstein explains how you can enhance your company's communications skills, strengthen ties to the press, and manage media relationships effectively over the long-term. The incisive insights and practical suggestions in this book will help you take charge of any crisis situation. You can learn to repair your company's public image, and maintain goodwill with the community. Holstein offers you seasoned advice, including how to: - Make sure that your message is always heard - Work with coalitions of labor, environmental, religious, and shareholder groups more effectively - Put press relations first - Establish and maintain positive relationships with the media - Manage the explosion of social media Manage the Media (Don't Let the Media Manage You) is the resource you need now. Your reputation--and your company's--are depending on it. From our new Memo to the CEO series--solutions-focused advice from today's leading practitioners.